Most of you know I don’t mind a useful gadget or two, and in the past week I have been trialling a new GPS emitting / tracking device (see iPhone photo below) to track and record our current D4 location and continually log our trip legs each day. Most importantly and hopefully this will never be required, our SPOT device can also function as an emergency SOS beacon. 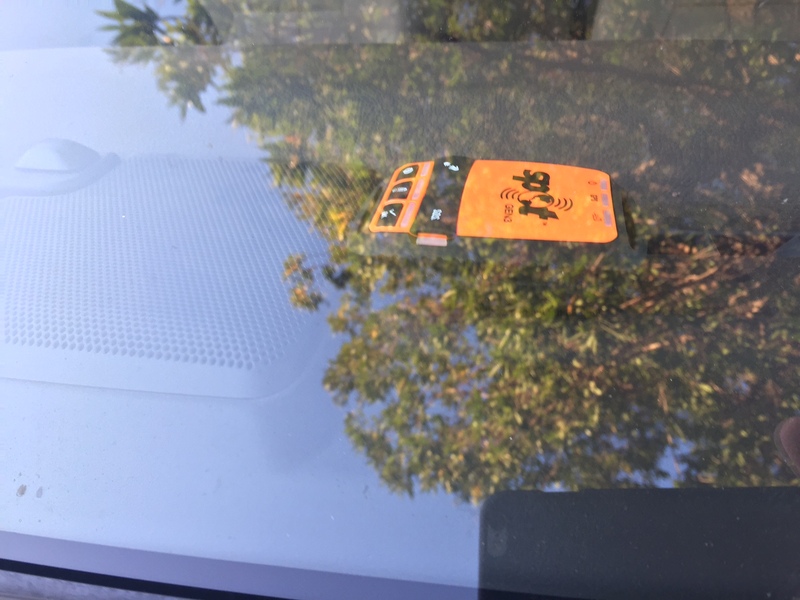 Shortly, we’ll start mapping our GPS location data from this device automatically into our main blog load up page as soon as I find a feasible work around to code in our GPS coordinates without creating/updating this blog each time. The current limitation in doing this today is WordPress recently (in Aug2015) started blocking iFrame code use on their blog sites globally …ironically, citing for security reasons. In the meantime, I hope this interim link just below works to show our current GPS location and, where we’ve been in the past week, and every day moving forward. Don’t forget to click on the – or + buttons on the Google map to adjust the map perspective otherwise you’ll just be zoomed into our current location. The little “Willy’s Jeep” picture – that’s where we’ll be presently located each time you click on the below URL! That’s brilliant Geoff! Just watching you come down the coast while I have lunch…. Bit of a late start this morning too 😉 Got to love technology. It must have been like watching the F1 live-telemetry watching us come down the coast while nudging an ave 91kms p/h yesterday – hate those big head winds like we had yesterday whilst towing the van. Glad you liked the new toy!! If you are outside the Westpac bank in Port Headland then it is great Geoff. Wow the technology thesedays is fantastic. I guess I won’t be sneaking off to do some clothes shopping anytime soon! yep, another use of this device is that anytime SPOT goes near shops or malls, you can set it up to auto-lock your credit card(s). very useful! Hi Geoff, Celia and boys..
Good to see you are immersing yourself in everything that Coral Bay has to offer, you’ve visited just about every beach and cove!! Wondering if you have experienced the weather front making its way north yet?? We have had quite a bit over the last 24 hours. A nice change! Love the blog and photos, looking forward to staying in touch with your journey! Paul, Danielle, Zoe and Byron. Thanks guys! We really love it here and will be sad to leave. Hamelin Pool and Steep Point are on our list. Only one night of BIG wind, then back to blue water and white sand again. Enjoy the Swan Valley, we could do with a bit of gourmet food and wine about now!